1. Certificate«SPSC», Lithuania, No. 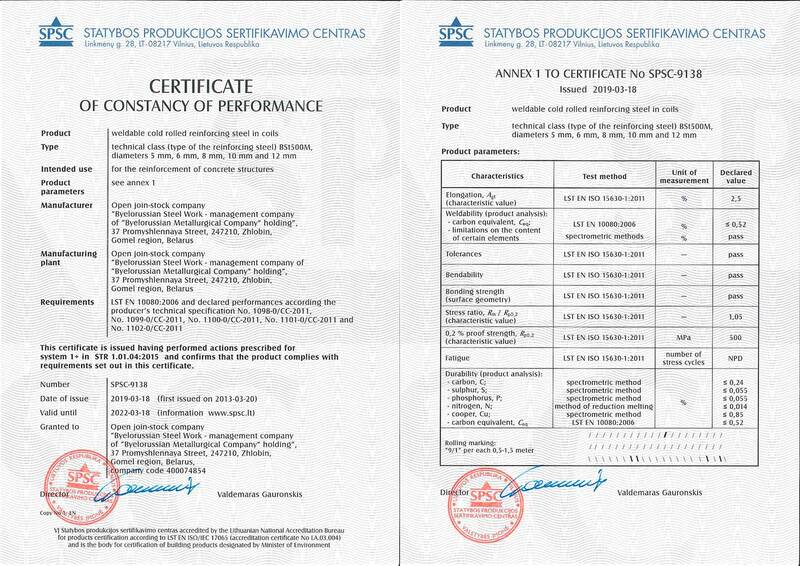 SPSC-9139 for production of weldable cold-deformed reinforcing steel in coils BSt500KR(A) Ø 5,6,8,10,12 mm in conformity with standard LST EN 10080:2006 and producer’s technical specifications No.1098-0/CC-2011, No.1099-0/CC-2011, No.1100-0/CC-2011, No.1101-0/CC-2011, No.1102-0/CC-2011. 2. Certificate«SPSC», Lithuania, No. SPSC-9137 for production of weldable cold-deformed reinforcing steel in coils BSt500KR(A) Ø 5,6,8,10,12 mm in conformity with standard LST EN 10080:2006 and producer’s technical specifications No.1098-0/CC-2011, No.1099-0/CC-2011, No.1100-0/CC-2011, No.1101-0/CC-2011, No.1102-0/CC-2011.